You've got to hand it to the French; they really do know their transgressive art. A new game, in development by Paris-based startup Le Cartel, is promising something truly... extreme... in terms of its content. To be published by Devolver Digital on September 5 on PC, Mac and Linux (with a console version coming later), Mother Russia Bleeds initially looks like a fairly standard retro-themed beat-em-up. That impression doesn't last long, because then the violence kicks in and it is violent. 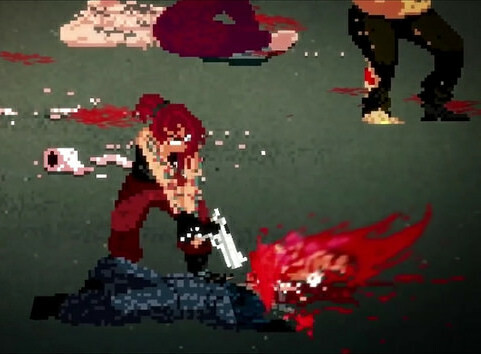 From the press release: “Mother Russia Bleeds has everything the kids love these days like beating someone to death with a toilet during a prison riot and injecting drugs into your neck in order to punch off a gangster’s head,” noted Devolver Digital CFO Fork Parker. So, as you can see, this is a game that is selling itself entirely on the gore, with bodies being carved away, and blood flying everywhere in every battle. How it actually plays, we have no idea, but in fairness that violence might just have a point. It looks like the game is quite transgressive, so hopefully there's some commentary built into the experience. Trailer below. Naturally there's a content warning, though it's "only" extreme gore. People seem to be cool with that. It's only if one of the characters wears a bikini would we be looking forward to there being criticisms over the content.